Have you ever asked yourself "Why don't I learn?" after repeating the same mistake you've made several times in the past? It might be work-related blunders or associating yourself with the wrong people again and again. If you're looking for a life companion, you may sometimes feel that you're choosing Mr. or Ms. "wrong" over and over. And then you wonder why you didn't realize that you were attracted to the same traits that eventually made you part with the last companion. 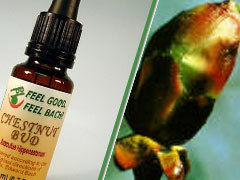 The Bach Flower Essence to help you begin to learn from life's lessons is Chestnut Bud. Chestnut Bud opens the lines of communication with your higher self, allowing you to identify the situations and learn from them. But just as importantly, it gives you the courage to cut the ties that bind you to your past mistakes. In children, the Chestnut Bud state may be seen as an attention deficit, because they keep forgetting the same things over and over. They simply seem not to be paying attention to what they need to learn and do. Unfortunately, they may consequently be diagnosed with ADD and treated with harmful drugs. If you're asking "Why don't I learn?" or if your child seems unable to pay attention and learn from mistakes, try Chestnut Bud. Bach Flower Essences are a safe alternative to pharmaceuticals, and could put you or your child into a state where you can learn from life and benefit from all your experiences. To learn more about Chestnut Bud and other Bach Flower Essences, visit www.bachflower.org. If working with others is painful, you've probably tried to avoid it by taking jobs where you can work alone. You're probably greatly admired for being able to "handle it all" on your own. But, it doesn't get you many friends. You might be content to remain solitary, even if lonely, but sometimes there is just no choice, you have to interact with clients, or with bosses and co-workers. And worse - sometimes you have to let them do some of the things that you could probably do better. The Bach Flower Essence Water Violet can help you become more comfortable in situations where you must not only work with other people, but rely on them. In fact, after treatment you may learn that you enjoy letting someone else carry part of the load. Go read about it. And if you think you'd be a bit happier if you allowed yourself to let go a little, begin treatment with Water Violet. Bach Flower Essences can make a huge difference in your happiness quotient. So give them a try. Blocked energies - out of control emotions - and a disconnect from our source energy is quite often the reason why we don't achieve what we wish for - either personally or professionally. Any time is the right time to take action to correct those problems. But now, at the traditional time of year to make new resolutions and new starts, it's an even better time. Why not solve those energy / emotion problems once and for all? Why not go into 2011 free from the restraints they place on you? If you aren't happy today and if you aren't achieving the success you want from life, take time to explore the reasons why. Go to FeelBach! and take the questionnaire. Since no one else you know will ever see it, be brutally honest with yourself. See what the experts at Feel Bach recommend to help you get past those problems. They'll give you a recommended formula of Bach Flower Essences. When they do, go to www.bachflower.org and look up each of them. See what kind of blocks you may be hiding from yourself. And then, of course, order your formula and begin using it to make 2011 your best year ever!